BROOMFIELD, Colo., Feb. 28, 2017 /PRNewswire/ -- Global businesses are in the midst of a digital transformation that is accelerating the need for agile, secure networking solutions. To help enterprises achieve greater visibility and control over their networks, Level 3 Communications, Inc. (NYSE: LVLT) is expanding its award-winning Metro 2.0 global Ethernet platform and software-defined networking (SDN) solutions to the Asia-Pacific region. Enterprises can now access Level 3's agile Ethernet platform from two access points each in Hong Kong, Tokyo and Singapore, for a total of six access points in the region. Learn more about how Level 3's agile Ethernet platform can help businesses reduce costs, enhance operations and remain competitive in a rapidly evolving marketplace: http://www.level3.com/en/products/ethernet/. Level 3 Ethernet services reach more than 290 markets around the world with flexible bandwidth options ranging from 2 Mbps to 6 Gbps. For Level 3 customers taking advantage of Level 3's SDN-based solutions platform, Adaptive Network Control Solutions (ANCS) with Dynamic Capacity, data utilization thresholds drive more than 70 percent of monthly events. Enterprises currently employing Level 3's Dynamic Capacity drive more than 1,500 bandwidth scalability events per month, with as many as 75 percent occurring during normal business hours to reduce IT resource constraints. Level 3's Ethernet platform provides full E-Line and E-Access product capabilities inclusive of Ethernet Virtual Private Line (EVPL) and Ethernet Private Line (EPL), for global end-to-end connectivity to on- and off-net locations. This expansion further delivers on Level 3's goal to provide a single, global Ethernet product suite that offers a customer-defined networking experience, one that offers bandwidth scaling on demand and in near real time. With Level 3 Ethernet solutions, enterprises have the performance of private connectivity, scalable bandwidth and custom configuration options ideal for secure connections between corporate headquarters, public and private data centers and public, private and hybrid cloud environments. Level 3 began operating in Asia Pacific in 2004; the company has 14 on-net markets throughout Asia Pacific with service reach to more than 50 markets in the region. Level 3 recently announced the deployment of DDoS scrubbing centers in Hong Kong, Tokyo and Singapore. Level 3 offers global cloud and data center connectivity to businesses in the region, with on-ramps to AWS as well as to Microsoft Azure in Singapore. In addition to its agile Ethernet services, Level 3 offers customers in the region Virtual Private Networks (VPN), Direct Internet Access, managed services, unified communications, content delivery networks (CDN) and security solutions. "Growth, efficiency and security are what global enterprises need to remain relevant and competitive in the new digital economy. Our expansion in the region puts real-time information and control into the hands of the business to support the seamless, trusted experience demanded by their employees, partners and customers." "As enterprises evolve, they rely on network solutions that can easily scale and adapt to the needs of the business. 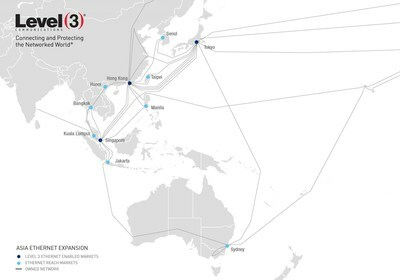 The expansion of Level 3's dynamic Ethernet services to strategic markets in Asia Pacific not only demonstrates our ongoing commitment to the region, it is the next step in delivering a customer-defined networking experience over a single, global Ethernet product suite." Level 3 Communications, Inc. (NYSE: LVLT) is a Fortune 500 company that provides local, national and global communications services to enterprise, government and carrier customers. Level 3's comprehensive portfolio of secure, managed solutions includes fiber and infrastructure solutions; IP-based voice and data communications; wide-area Ethernet services; video and content distribution; data center and cloud-based solutions. Level 3 serves customers in more than 500 markets in over 60 countries across a global services platform anchored by owned fiber networks on three continents and connected by extensive undersea facilities. Level 3 services are provided by subsidiaries of Level 3 Communications, Inc. For more information, visit www.level3.com or get to know us on Twitter, Facebook and LinkedIn.